This was a nice gig. I like to work on urban documentaries. This is the story of Hugues Dufour, a Montreal chef who moved to New York to open a steakhouse in Queens. The movie follows him over the 2 years he spends working on the project. As the colourist, I was ask to reproduce the look and feel of 80s family movies and 8mm video. I used a heavily contrasted Kodak LUT and some dirty film grain scans from Gorilla Grain. 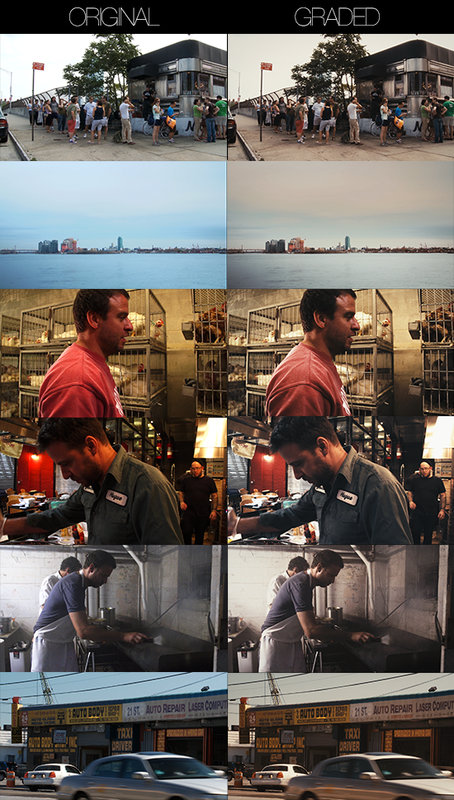 We wanted to match the low-lalitude FS100 and EX3 to the dirty look of the archive footage used in the movie. The black were clipped on purpose but stayed high to give a washed feel to it. Pour le documentaire Steakhouse, nous avons suivi les aventures de Hugues Dufour, ancien sous-chef pour Martin Picard, dans son projet d’ouvrir un steakhouse à New York. 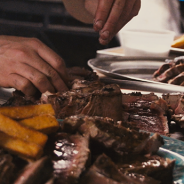 Ce qui devait prendre deux mois aura finalement pris plus de deux ans, mais le jeu en a valu la chandelle et le restaurant M. Wells Steakhouse est maintenant ouvert, et l’équipe du film était sur place pour suivre toutes les péripéties et vivre tous les moments marquants de cette aventure.